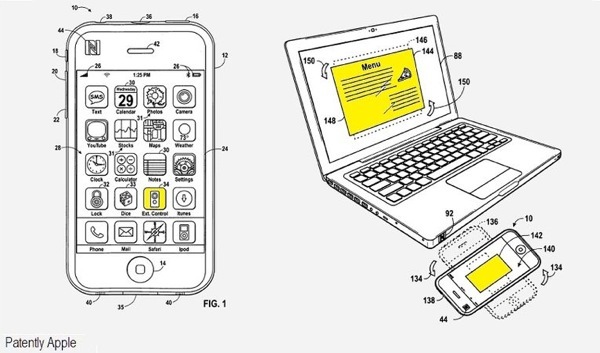 A recently revealed patent suggests Apple has exciting plans for its future iPhones and laptops centering on near-field communications. Soon just popping your iPhone near a MacBook may enable wireless syncing. And that’s just the start. Near-field communications themselves aren’t new, but it would be for the Apple devices in question. The technology centers on extremely short-range wireless interactivity between two devices–you may have heard of the tech in uses like wireless credit-card payment by cell phones in Japan. 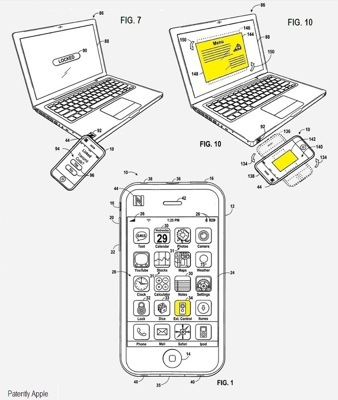 And Apple’s patent takes the idea to some extremely elevated levels, with a future iPhone acting as a near-field key to all sorts of clever interactivity. The simplest scenario would involve an NFC antenna embedded in an iPhone, with an interactivity range of about 2-4cm, and a MacBook with similar circuitry. Bringing the two devices close together activates the link, and the accelerometers in the iPhone will allow for actions like unlocking the MacBook, rotating an image on screen or even unlocking a combination lock with complex gestures. Once this circuitry is in the iPhone, however, it opens up all sorts of possibilities, as Apple notes, and your iPhone could even be programmed to activate proximity sensors for secure entry to office buildings–with the added benefit that you tend to carry your phone at all times. And since the iPhone is smarter than the usual dumb keycards used for this purpose, it could even enable better security, with PIN-code access and even automated alerts if the iPhone is being used improperly. Apple also notes that an NFC connection could be used to trigger a LAN or WAN connection, which would then allow fast wireless comms between a computer and the iPhone and a greater range of connection between the two devices. Sounds like an answer to long-demanded wireless syncing between iPhones and iTunes–especially since iTunes itself is referenced in the patent. But will we see this implemented in iPhones any time soon? As with all Apple patents, Apple could just be covering its back, and it may never intend to actually bring the idea to market. But this concept is so blatantly useful, and the technology is already largely proven and cheaply available that Apple certainly could attempt it–perhaps even as soon as the version 4 iPhone expected in the middle of this year. Could it even be the reason behind the slightly elongated case seen in recently leaked images purporting to be the iPhone 2010?